COLOR(S):Liver or a combo of liver-and-white often speckled, spotted, or ticked. 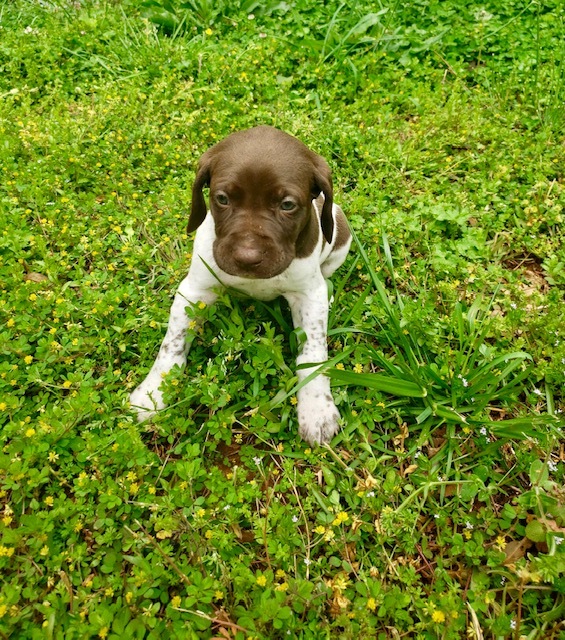 The German Shorthaired Pointer is a versatile hunter and an all around gun dog capable of high performance in field and water. German Shorthaired Pointers are excellent watchdogs. 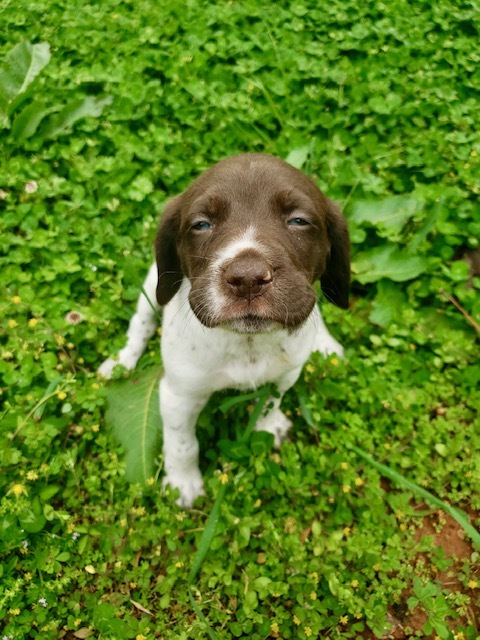 They are one of three different breeds of the same kind: German Shorthaired Pointers, German Long-Haired Pointers, and the German Wirehaired Pointers. They prefer to live with people and should not be left alone. If they have to be kenneled, they should have a playmate. They are reliable with children and make good family pets. Exercise is vital for a well balanced dog of this breed, as they are very active and may become destructive if not exercised enough. 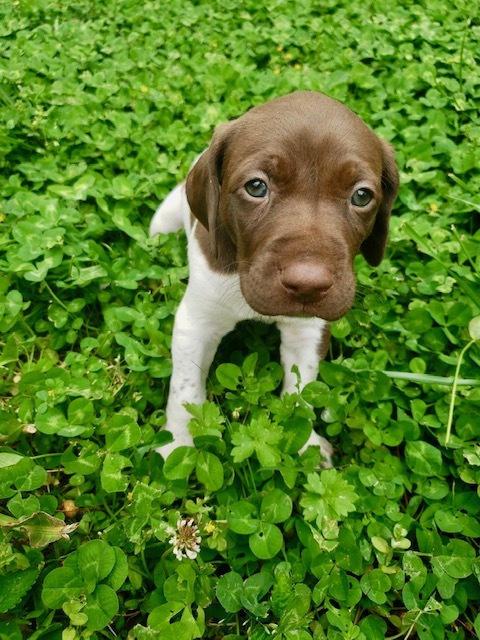 German Shorthaired Pointers are friendly, hard working, and live long lives. They get along well with family, including children, and is quite easy to train. They love to learn and are eager to do so. German Shorthaired Pointers enjoy the water as much as the land. They can be timid, but careful breeding should solve this problem. They are expressive with their stubby tail, and enjoy their master\'s attention. 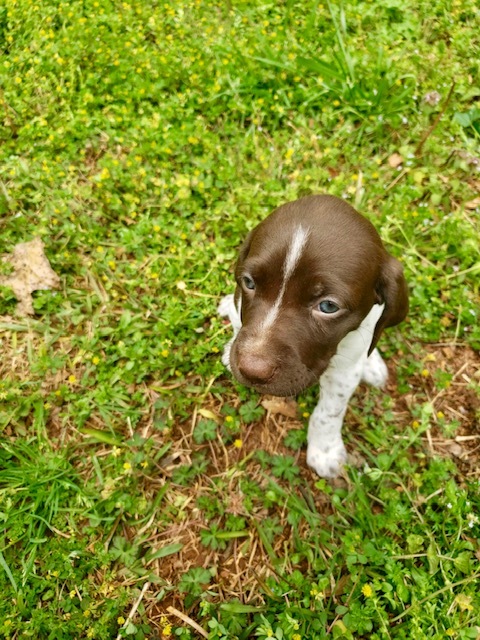 German Shorthaired Pointers sometimes do not realize what boundaries are, and may resort to destructive behaviors if not given enough attention or exercise. They are comforting in heart and spirit, and are a good pet if given a job to do. 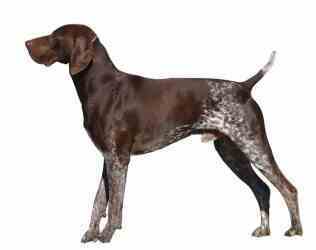 German Shorthaired Pointers are active, responsive, gentle, affectionate, and even-tempered. They are friendly to friends and families, although some strains are timid. They are excellent working dogs, and love more than anything to go out with their master and hunt. They enjoy water or land equally. German Shorthaired Pointers are exuberant at times, with their energy abounding. They get along well with children, and are adaptable to many different kinds of life. They are good natured, sad if you leave, and excited when they know they\'ve pleased their master. They are also very alert to their surroundings.